Sales is often compared to a funnel. Businesses attract a large number of leads from the various marketing efforts they make. However, by the time they become actual customers, those numbers drop significantly. This is especially true for goods and services that represent a significant investment. During the funnel process, businesses attempt to guide leads towards the buying decision through education, relationship building and trust. While the different parts of the sales funnel are important to your bottom line, the most important part is the middle – transforming a lead into a customer. While there are many who will drop off early, especially if you have cast a very wide net with your marketing, handling qualified leads professionally can ensure that a higher percentage become actual clients. The relationship is the key to sales. These tips will help you in your efforts to funnel potential clients to purchase what you are offering. Understand that each lead is different. What works for one may not work for another. If you sell more than one type of product, or work with different industries, this is especially true. Be sure you figure out, early on in the funnel process, which of your goods or services are the best fit for your leads. Building trust takes time. Don’t give up on a prospect who doesn’t buy during the first communication. He may just be discovering the real need he has for the solution you provide. Give him time to consider the information he has learned and evaluate the solutions you have offered. This is where relationship building comes into play. Many salespeople put pressure on prospects, but it often backfires causing the prospect to reject the solution being offered. In reality, a prospect may not be in a place where he is ready, financially or otherwise, for what you offer, even if he really does need it. Critical to relationship building is a good contact management system, because it allows different representatives of your firm to support the building process. Leaving detailed notes in the contact management system facilitates this, so a prospect doesn’t lose interest before becoming a customer. It is normal to lose prospects along the way, because they simply don’t need what you are offering, can’t afford it or are just not interested. Keep your notes on such individuals for at least a year. Sometimes, things change and a former lead that you thought you had lost can once again become a qualified lead. Being able to pick up with that person from where you left off (with the help of your contact management system) is powerful when it comes to relationship building. From commitment to the actual transaction, there may be a delay in some cases. This may be because of seasonal needs, cash flow issues or other reasons. Again, the data available from your contact management system allows you to move forward easily and quickly with a delayed sale and impress the new client with your attention to detail because you still have information that had been shared prior. Don’t forget post-purchase attention to the relationship. Happy customers become loyal fans of your business who recommend you to others or become repeat customers. 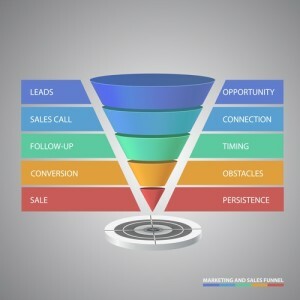 Understanding the sales funnel, and putting as much or more attention on relationship building as you do on getting leads, is crucial to the success of your small business. Invest in tools that allow you to excel at relationship building for the good of your business. This entry was posted in Contact Management, Customer Relationship Management, Sales by Jim Li. Bookmark the permalink.